2015 Panini Prizm Collegiate Draft Picks Football is the card maker's second NCAA product under their new deals with virtually every major school. Boxes deliver just 12 packs but still come with a pair of autographs plus a handful of inserts and Prizm parallels. 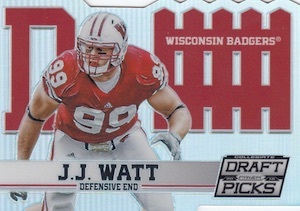 The 2015 Panini Prizm Collegiate Draft Picks Football base set has 250 cards. One hundred are current NFL players pictured from their college days. 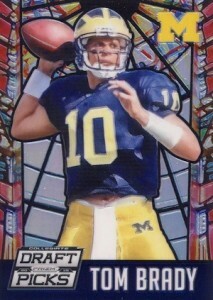 The remaining 150 cards feature players slated for the draft. Draft picks are inserted two per five-card pack. As with all Prizm releases, base cards have several Refractor-like Prizm parallels. Colors and patterns this time around include Blue, Camo, Tie Dye, Gold, Green, Black Finite, and Red, White and Blue. 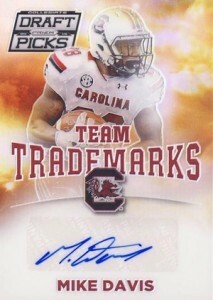 Among the signed sets in 2015 Panini Prizm Collegiate Draft Picks Football are Draft Picks Autographs, All-American Autographs, Alumnus Autographs and Team Trademarks Autographs. 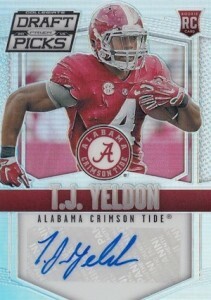 NFL Stars Alumnus Autographs feature select veterans. Like the base set, autographs have several parallels that are available in varying quantities. 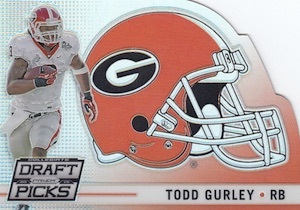 2015 Panini Prizm Collegiate Draft Picks Football hobby boxes are rounded out with four basic inserts. Team Trademarks and All-American return with unsigned versions. D Fence and Helmet are both die-cut inserts. Finally, there's Stained Glass, which lands one per box. 250 cards. Shop for base sets on eBay. Many of the parallels are #1/1, regardless of color. View the full spreadsheet for specific print runs. patrick � This is a college product so it should be all NCAA uniforms. It will likely be similar for college-only basketball products. I’m not sure what plans are for all products, but I suspect some will have a mix of college and pro uniforms, especially for early-season sets where college pics could be used for rookies to get things out quicker. 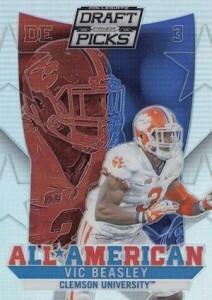 patrick: Panini recently got the college license from Upper Deck for football only. So, what they are doing is a couple of college products, then I believe for products like Prestige and Score, they will be able to have the players in their college uniforms but with NFL logos. If you remember Prestige from 2008, I believe that is what they are going for. They also will have the exclusive NFL license starting next year, so Topps will be out of the NFL game for current players after this year. Currently, Panini’s exclusive for 2016 is only with the NFLPA, not the NFL. That could change but there is still a lot that’s up in the air. 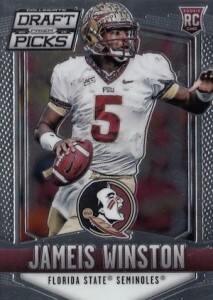 I am getting the impression that with Panini we are going to get sticker autos on everything below 100.00 a pack. They seem to be shifting all on card sigs to only the heist end brands. Its a good thing I don’t collect them! it’s a great looking card. big set so it will take a while to complete one due to the small number of cards in a box. 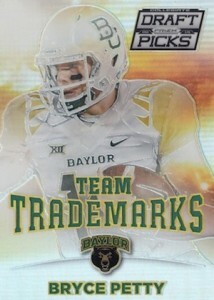 Has there been any info released about the team trademarks autos being short printed? I pulled a mariota but haven’t seen another one anywhere.